Einat Admony is a 21st-century balaboosta (Yiddish for perfect housewife). She’s a mother and wife, but also a chef busy running three bustling New York City restaurants. Her debut cookbook features 140 of the recipes she cooks for the people she loves her children, her husband, and the many friends she regularly entertains. Here, Einat’s mixed Israeli heritage (Yemenite, Persian) seamlessly blends with the fresh, sophisticated Mediterranean palate she honed while working in some of New York City’s most beloved kitchens. Egalley courtesy of Artisan via NetGalley in exchange for fair and honest review. Surprisingly this and the other cookbook [Franny’s: Simple Seasonal Italian] have been on my NetGalley request list for quite some time, perpetually pending approval. I’ve had time to forget I’ve requested them in fact. And then, one after another, I got the magic email notifying me that I’ve been approved. A pleasant surprise indeed! Cookbooks always make me happy. Here, Einat Admony, mother of two and chef/owner of the three Manhattan eateries: Balaboosta, Taim, and Eama’s Kitchen, offers a glimpse into her own kitchen(s) with a variety of dishes that showcase both her Israeli heritage and Mediterranean cuisine. I have to say that the food from Mediterranean region is simply divine; so I had no doubt I would enjoy this cookbook and find plenty of new ideas for use in my own kitchen. 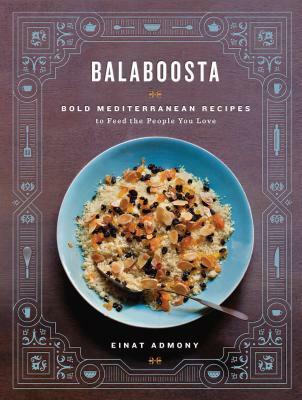 In the beginning of her cookbook, Einat writes that to her, balaboosta “is all about: emotion expressed through food.” She paints herself as the one who loves to feed everybody, to make her family and friends happy through food. I can relate to that. So, perhaps, I too can call myself balaboosta? Although, I certainly hope a crowd of people will not relocate themselves to my house for weekly festivities. “…a few times a week, I invite anywhere from two to thirty people to my Brooklyn apartment, where we enjoy a spread of appetizers, salads, entrees, wine, and desserts similar to what a customer would find on the Balaboosta menu.” Balaboosta (p. 18). The book is filled with a variety of recipes, each full of Einat’s passion for cooking. Divided into several sections, from Hurry, Hurry, Hurry: Quick and Easy Meals, Fat Like Me: Healthier Options, to Fancy-Schmancy: Dishes from My Restaurant and many more. Einat frames the chapters with stories from her family table and various suggestions on serving, substituting, and other commentary. And that gives this cookbook a definite sense of a conversation.